This is the BIG ONE! It gives you Structures, Pulleys & Cranks, Wheels & Axles, and Gears, Sprockets, & Chains all in one. It’s ideal for library makerspaces and creative spaces in classrooms. It’s big enough to share across classrooms and it’s a BIG launching pad for special challenges and schoolwide design/build projects and contests. Creating maker spaces in your school? Choose the complete STEAM Center & Save! We welcome purchase orders from recognized educational, library and other service or nonprofit organizations. Complete the fast form here or call us directly at 720-446-5558 for details. Get the latest news about Brackitz in education. The Brackitz award-winning collection of hands-on construction kits puts real-life art, math, science, architectural, and engineering principles into play. Open-ended and flexible for learners Prek-8 and beyond, Brackitz encourages imagination, creativity and discovery. 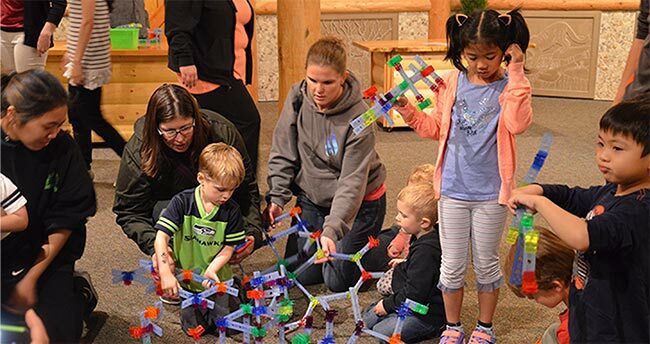 Brackitz’ large planks and connecting hubs are simple enough for young learners and engaging enough to captivate older learners as they imagine and design more complex creations.